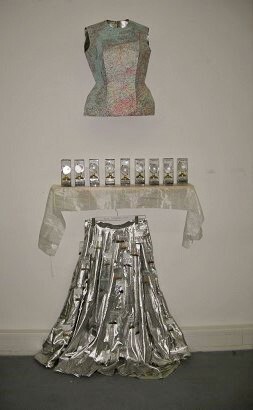 In the Summer of 2009 at the Artfestival ´48 Hours Neukölln´ the project ‘The Earth is indivisible’ started. It this ‘Work in Progress’ glasses filled with Earth from the countries all over the world are coming together in Berlin at my Artspace ´Kunstraum Art-Uhr´and lots of people are participating by carrying earth for the project. When people ask me “Why are you doing this” ? I only have one answer: “Because I Love the Earth,for me Earth is warm living material and energy with a consciousness of its own, it speaks to me since a was a child, but more and more when I growned up there was a kind of duty to forget this quiet universal language and in my mind only existed a kind of memory that I was a part of the Earth, like an abstraction, without connection ! 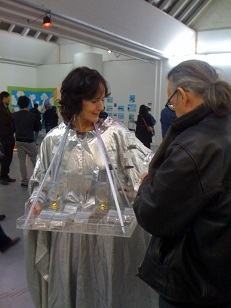 During the performance I ask people to participate by pinning a small earth-pocket on the silverdress of the ‘Terra Incognita 2011 and I invite people to remember their own relation with Mother Earth !